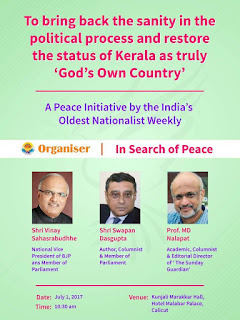 RSS oldest Nationalist weekly “Organiser” will hold a one-day brainstorming session on issues connected with political violence in Kerala, especially in Kannur district, as part of its initiative to bring back the sanity in the political process and restore the status of Kerala as truly 'God's Own Country'. Intellectuals, media persons and politicians would attend the session to be held in Kozhikode on July 1 and leaders of both the ruling CPI-M and CPI are among the invitees. 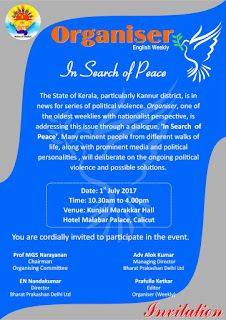 “This is an initiative for bringing in eminent intellectuals, media persons and politicians on same platform to discuss the nature of political violence and possible solutions for restoring peace,” Editor of the journal Prafulla Ketkar told reporters here on Tuesday. 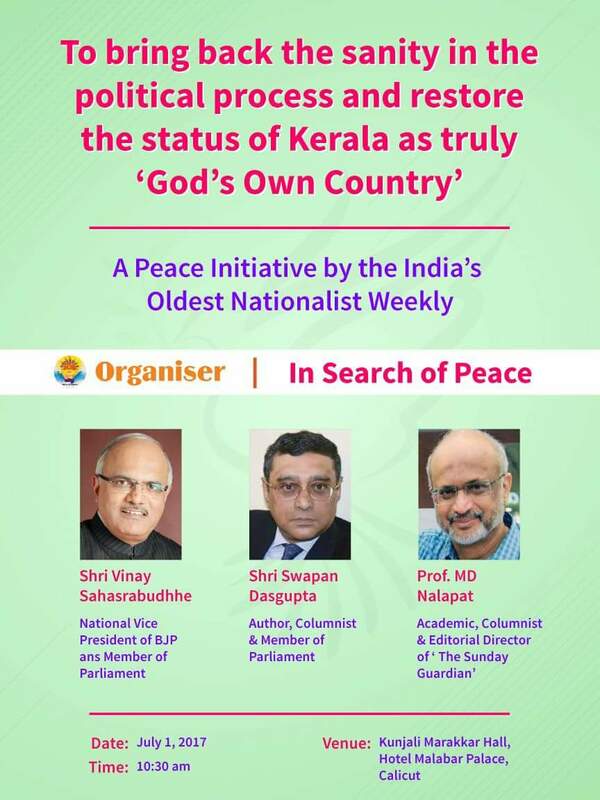 “Unfortunately, there are claims and counter claims about the number of political murders that have taken place in the region (Kannur), but nobody is talking about the way ahead for ending this insane politics,” he said. ‘In Search of Peace’ was a beginning in this regard by associating distinguished personalities from the different walks of life in the state, he said. “We expect that representatives of all political parties will attend the meet,” Ketkar said. Politically volatile Kannur has witnessed a series of political murders and clashes involving CPI-M cadres and RSS-BJP in the past several years. There was no news of this Seminar in any TV.Media crooks deliberately blacked out this event, probably at the behest of the ruling reds! Pl publish a report of the event.